(Newser) – Somebody who bought a Powerball ticket in Massachusetts has scored the biggest solo jackpot in American history. But state lottery officials have a major correction: It turns out, the winning ticket for $759 million was sold at a store in Chicopee, not Watertown as originally announced, reports the AP. 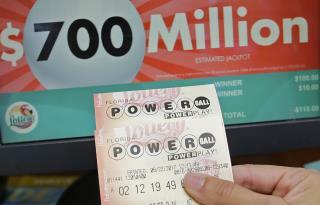 "Human error, plain and simple," says the state lottery's executive director, Michael Sweeney. The store in Watertown did sell a ticket worth $1 million, perhaps playing a role in the confusion, but the much bigger winner picked up the lucky ticket at the Pride Station & Store across the state. The numbers that won a jackpot were 6, 7, 16, 23, 26 and the Powerball was 4. The only bigger lottery jackpot in US history was 2016's $1.6 billion prize, but that was split three ways. Must work for NEWSER as a editor on the news staff. Steve Harvey works for the lottery? What we need more then anything, now that the multi-state lottery is a complete success, is a total accounting of all funds. I mean a quarterly statement from each and every state treasury department. An accounting for each and every cent of income and expenses. To whom, to what and to where the money goes and exactly how revenue is shared, distributed and allocated. How this money is used by our respective states should be decided by referendum and not pilfered by a select few government bureaucrats. In Michigan they keep raising all of our taxes, (property, school, sales, income, gas, fuel oil, pension, meds, etc.) and reducing basic services such as repairing our roads while never reporting where lottery revenues are going. Please don't whiz in my ear and tell me its going to our schools; Please show me. Its about raising revenues not making someone rich. (Certified Public Accountants) Not that I don't trust politicians... Oh wait, I don't!